Sunday March 17th 1895 Will took me to church in the morning. I was busy about the kitchen a part of the afternoon as it was very late when we got home. Will & Oliver went to the valley for a little while. I read most of the evening. 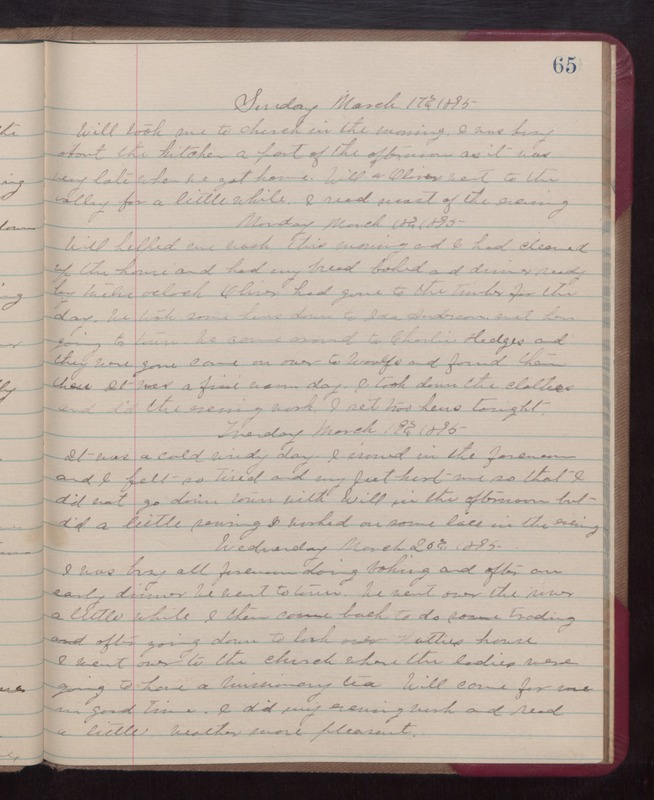 Monday March 18th 1895 Will helped me wash this morning and I had cleaned up the home and had my bread baked and dinner ready by twelve oclcok. Oliver had gone to the timber for the day. We took some hens down to Ida Anderson met her going to town. We came around to Chralie Hedges and they were gone came on over to Woolfs and found them there. It was a fine warm day. I took down the clothes and did the evening work. I set two hens tonight. Tuesday March 19th 1895 It was a cold windy day. I ironed in the forenoon and I felt so tired and my feet hurt me so that I did not go down town with Will in the afternoon but did a little sewing. I worked on some lace in the evening. Wednesday March 20th 1895 I was bust all forenoon doing baking and after an early dinner We went to town. We went over the river a little while. I then come back to do some trading and after going down to look over Hatties house I went over to the church where the ladies were going to have a missionary tea. Will come for me in good time. I did my evening work and read a little. Weather was pleasant.